Edibles (food containing psychoactive cannabinoids) are a delicious, easy, and portable method of consuming cannabis, and beg to be shared with many. The best party favor, incredibly effective for those bothered by smoking, the greatest afternoon nap you’ve ever had — edibles have the potential to satisfy anyone’s weed needs. The ~*secret ingredient*~ in edibles is what’s generally referred to as ‘canna-butter.’ It’s made by heating cannabis together with any vegetable oil, nut butter, or dairy/non-dairy butter — anything with a high fat content for THC molecules to bond with. I choose the animal-friendly option of coconut oil, or a dairy-free alternative like Earth Balance™. How you intend to use your ‘canna-butter’ should influence which fat you use. For baking, go for a fat with neutral flavor (like coconut). If you like more savory, I’d suggest olive oil or peanut butter, something you could add a spoonful of to pasta or a smoothie when you’re feeling frisky. In the saucepan over medium heat, melt your oil or butter. Once melted, add the cannabis. The ratio of fat-to-pot should be about 2:1. You’ll want to keep the mixture simmering throughout, as boiling may burn the weed. Stirring occasionally, you should be able to see your butter turn a rich hemp green. Many will say to simmer for at least an hour, but I’ve found 20-25 minutes to be plenty of time, and plenty effective. Ultimately, it’s up to you. So, whether it’s after 20 mins or 3 hours, remove the mixture from heat and set aside to cool for a bit. Strain the mixture through a nut/cheesecloth into your chosen container. (Save the detritus to use in edibles if you don’t mind grittiness.) You can freeze your canna-butter, which I’d especially recommend if you’ve used dairy, and it should last a few months. Oils will do fine in or out of the fridge, just store it air-tight and in a dark place. Use canna-butter in your favorite recipes as the butter/oil substitute, usually in a 1:1 ratio. If you’re not fussed with making a whole batch of cookies, spread some on toast! Either way, enjoy, be safe, and know that when ingesting edibles the effects may be stronger and last longer than what you’d find with smoking or vaping, so plan accordingly! 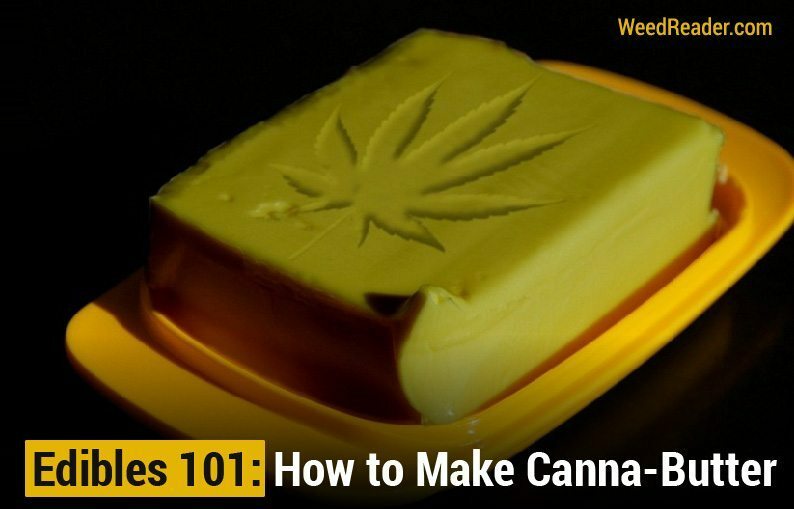 There are lots of ways to make your own cannabutter or cannaghee at home.